GULF OF ADEN – USS Pinckney (DDG 91), assigned to Combined Task Force (CTF) 151, working under Combined Maritime Forces (CMF) based in Bahrain, disrupted a group of suspected pirates close to the Internationally Recommended Transit Corridor (IRTC), south of Yemen, Dec. 19. 111218-N-ZZ999-070 GULF OF ADEN (Dec 19, 2011) A visit, board, search and seizure (VBSS) team from guided missile destroyer USS Pinckney (DDG 91), approached a suspected pirate after the Motor Vessel Nordic Apollo reported being under attack and fired upon by pirates. Pinckney is assigned to Combined Task Force 151, a multi-national, mission-based task force working under Combined Maritime Forces, to conduct counter-piracy operations in the Southern Red Sea, Gulf of Aden, Somali Basin, Arabian Sea, and Indian Ocean. At approximately 8:40 a.m., the Motor Vessel (MV) Nordic Apollo reported to the United Kingdom Maritime Trade Organisation (UKMTO) they were under attack and been fired upon by pirates from a skiff. Having registered their route with UKMTO in accordance with BMPv4, Nordic Apollo’s position was relayed to counter-piracy forces operating in the region. At approximately 11:00 a.m., the M/V Heather, operating 30 nautical miles from Nordic Apollo, reported suspicious activity by a skiff. Pakistan Navy Rear Admiral Kaleem Shaukat, CTF 151’s commander, authorised Pinckney to investigate. Nordic Apollo confirmed the pirate attack but stated they no longer had sight of the skiff. In response to the distress call, Pinckney made best speed to the area, issued a radio warning to other vessels in the vicinity, and launched her MH-60R helicopter. 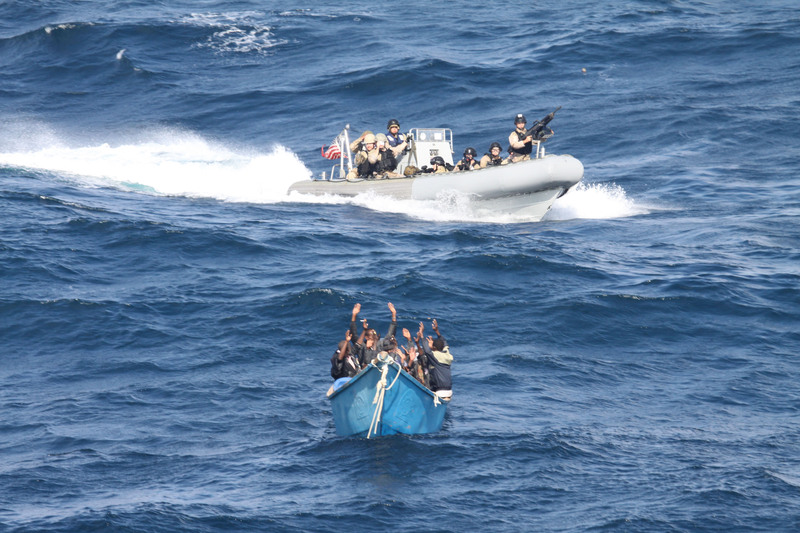 Having stopped the suspect vessel, Pinckney was given authorisation to conduct a boarding using their visit, board, search and seizure (VBSS) team. Once aboard, the VBSS team confirmed there were nine suspected pirates, one grappling hook, 36 barrels of fuel, a 75hp and a 45hp outboard engine. Scuttling one outboard motor, they left the skiff with enough fuel and water to return back to shore. Combined Task Force (CTF) 151, a multi-national, mission-based task force, working under Combined Maritime Forces to conduct counter-piracy operations in the Southern Red Sea, Gulf of Aden, Somali Basin, Arabian Sea, and Indian Ocean. The presence of Coalition Navy vessels in the region demonstrates a commitment to regional security and stability. To continue to counter and deter piracy successfully, Coalition efforts must be complimented by proactive measures by commercial shippers, regional governments, and the international community. Piracy is a threat to the security of all nations and requires an international solution. 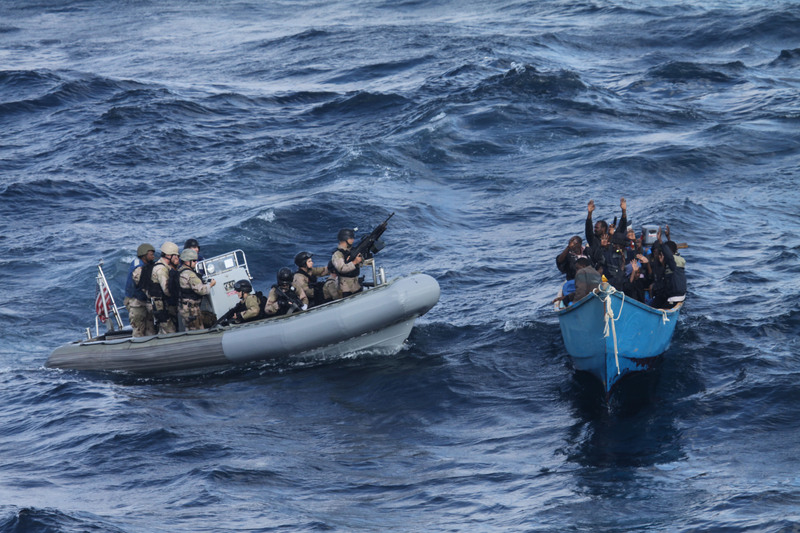 Combined Maritime Forces (CMF) are committed to continuing operations that deter piracy – and other destabilizing activities in the maritime arena – to create a lawful maritime order and promote the maritime environment as a safe place for mariners with legitimate business.